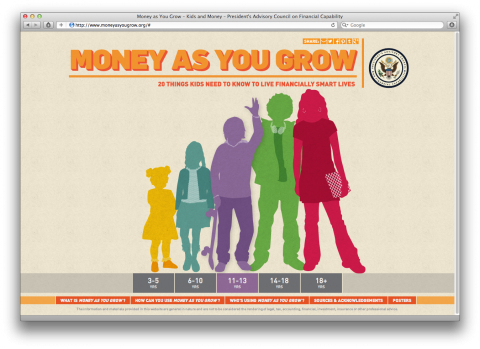 Listening to a radio show on NPR last week, I heard the mention of Money As You Grow, a site that helps parents teach children about money. I love how they break down the most important points into age group appropriate language. 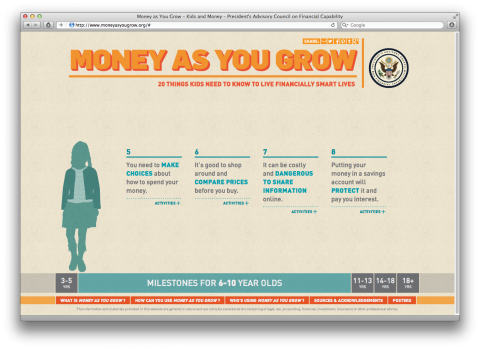 The site has been developed by the President’s Advisory Council on Financial Capability and provides 20 essential, age-appropriate financial lessons—with corresponding activities—that kids need to know as they grow. Two thumbs up! This, in my opinion, is a very preachy website. Everything is written through the lens of what you’re “supposed” to do. But that way of thinking is exactly what got our parents in trouble, and why they’re still working and not hiring any young workers. For example, it tells teenagers to save for retirement and to get familiar with 401(k)s. But by the time these teens are working, chances are they’ll be self-employed or freelance. The rules have changed. My parents followed two simple rules: give me an allowance, but nothing else. Explain (and reveal) the household finances honestly, at a later age. Zzzzz. Just another tweaked WordPress template. Nothing remarkable or notable about this, frankly. Cool and useful site, nicely designed. Nice digestible format. But have admit my first thought when I read who developed the site and info was, “really – we’re going take financial advice from our government? Like they’ve done such a good job with our money” ha! Thank goodness the government is here to help educate us stupid citizens how to save our money. What would we do with out them? Where is the chart explaining how the government will tax the money you make, then tax it again when you buys something, and God forbid if you should inherit something…. that’s already been taxed once before. Can I explain to my child how our tax money went towards creating this site? Maybe this should be prescribed reading for the bankers of USA and the movers and shakers of Wall Street, getting them to start right from the bottom? Just a thought from Down Under! This is exactly what takes americans to be how they are. All you care is about money. Teaching a 3 year-old child how is it that playing with a friend is “free” is simple lame. The “american dream” is truly a nightmare. After going through the site, I have to agree with some of the comments above – rather friendly GUI, but the content is something that reminds me of micro-managing.